Ashisogi Jizo "Konjiki Ashisogi Jizo"
Ashisogi Jizo is Mayuri's Zanpakutō. Ksitigarbha is a bodhisattva that watches over children and the underworld. In Japan, where he is known as Jizo, he looks rather like a baby dressed as a Buddhist monk. 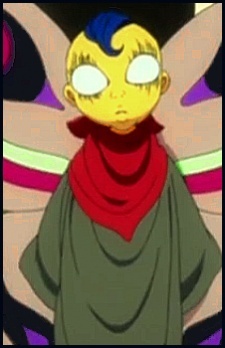 In Zanpakutō form, Ashisogi Jizo has what looks like a giant baby's head on it. Its hilt is wrapped in cloth, and has several spiky protrusions sticking out right below the blade, which appear to resemble leaves. Ashisogi Jizo's Shikai command is "Rip" (掻き毟れ, kakimushire). In its Shikai, Ashisogi Jizo transforms into a deformed trident with curved, serpentine blades and a guard shaped like a baby's head (as Ksitigarbha is depicted), all mounted on Mayuri's sword's normal hilt. Shikai Special Ability: The baby's mouth secretes a poisonous vapor in this form. The weapon works like the venom of a spider bite; when an opponent is stabbed by Ashisogi Jizo, it severs the brain signals controlling the neural impulses for movement in the limb's of the victim, regardless of where they were struck. Unlike regular paralysis, the pain receptors and nerve endings are unaffected by the weapon, so the victim can still feel pain, even in a paralyzed limb. During the Bount arc, it is shown that healing the stab wound does not immediately remove the inflicted paralysis. Konjiki Ashisogi Jizo (金色疋殺地蔵; Golden Leg-Cutting Jizo): returns Mayuri's Zanpakutō to its sealed state and produces a giant caterpillar in a red cape with a grotesque baby's head and a silver halo. Bankai Special Ability: The creature breathes a poisonous derivative of Mayuri's blood which is lethal to anyone who breathes it, aside from Mayuri and Nemu. Numerous blades can also extend from its chest, allowing it to run through and skewer opponents. Only Mayuri has a cure for its poison, though Nemu usually carries it around. Mayuri can change the composition of the poison, as well, ensuring that no foolproof antidote can ever be manufactured to cure it, and no immunity developed against it. Mayuri has physically modified Konjiki Ashisogi Jizo itself so that it will self-destruct and return to its sealed state if it were to attack him, implying that it is sentient as well as organic, reminiscent of Captain Retsu Unohana's Minazuki. Ashisogi Jizo also has the ability to transform Mayuri into a liquid when he stabs himself with its blade. Doing so doesn't kill him, but instead simply leaves him unable to attack or be attacked, making it an effective escape tool. He reforms after a few days. It's uncertain whether this ability is entirely the product of Ashisogi Jizo, since he specifically relates the ability to himself, not opponents. Mayuri's various physical modifications may have something to do with the effect.